Choosing a roofing contractor to replace your home’s roof can be a challenging task as it can be difficult to know who to trust to perform such critical work on your home. With so many contractors to choose from it is easy to feel lost and not be sure where to start. To help you find the right roofer to work on your Downriver home, here are a few steps you should take as you begin your search. One of the best ways to find a local, reliable roofer in your area is to ask friends, family, and neighbors for referrals. If the houses in your neighborhood were all built around the same time, then it is likely that you aren’t the only one getting a new roof. Asking your neighbors for referrals can be a great way to get first-hand accounts as to the quality of a roofer’s work, and what it was like to work with them. Additionally, getting a referral from someone who can vouch for a roofer reduces the risk that you will get scammed by a less than reputable contractor. Of course, another great place to look as you narrow down your options is at online reviews. This can give you a wide range of perspectives as to the quality of a builder’s work and what it is like to do business with them. However, online reviews may not always be accurate, so it is critical that you meet with multiple builders in order to get a feel for who you may feel comfortable working with. Once you have narrowed down your list of builders to a couple of options, you should consider asking each of them for references. Reputable builders will be more than willing to provide contact information from recent clients who will vouch for the quality of their work. When you meet with roofers as you continue to consider your options, it is important that you make sure that each contractor has the proper licensing and insurance. It is critical that any contractor working on your property has sufficient liability insurance, as you may find yourself being sued if an employee of an uninsured roofing company is injured on your property. While most states require roofers to be licensed, it is still important that you ask for proof of licensing as some unlicensed contractors will occasionally try to do roofing work. A reputable builder will understand why you are asking to see proof of licensing and insurance and will be more than willing to show you this documentation. If a contractor gives you a hard time when you ask to see these documents, then this is a sign that they may be trying to scam you and you should not work with them. You should also ask potential roofers what kind of warranty your roof would come with, as the quality of the warranty may indicate the quality of the work they perform. A good roofer will provide an extended warranty, if not a lifetime warranty, that will guarantee your roof against potential defects and damage. When considering your options you should also take into account how long a roofer has been working in your area. 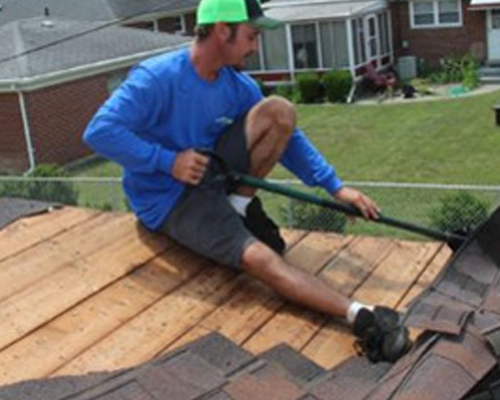 Considering the critical role a roof plays in protecting your home you will want to find an experienced roofer, not someone who is new to your area. Choosing a roofer who has been working in your area for a long time also makes it more likely that they will be around for years to come, which is important as your warranty may not be worth much if a roofer goes out of business. Considering the importance of finding the right roofer, it is critical that you take your time and do not rush into making a decision. Contact us for additional advice on steps that you can take to find the best roofing contractor in Downriver Michigan.